The Patels have been known to be well to do; why then are they agitating for quotas? Young Patels took their SUVs to attends Hardik's rallies seeking reservation. Social scientists and political observers may keep on debating the ideological roots of the agitation by Gujarat's Patels seeking job quotas. But a closer look at ground realities points towards some hard economic realities that probably provoked the upwardly mobile community. Unlike in other agitations, Patel activists would come to their venue in SUVs and luxury buses, critics pointed out. But then the community is not really one of have-nots in need of food and shelter. 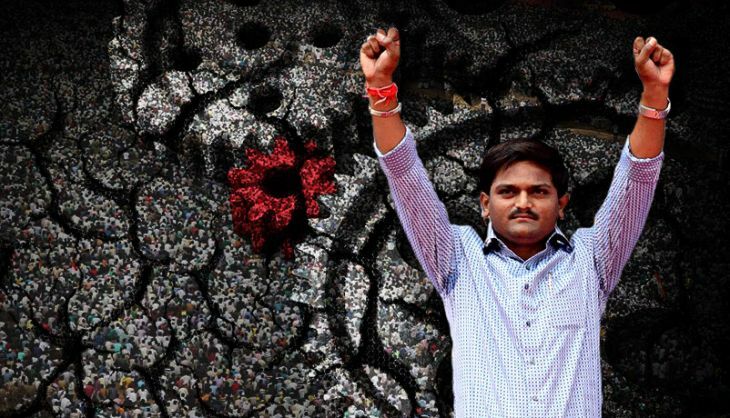 The movement started by the Patels of Gujarat is related to their ever-increasing aspirations. They already have the basics and more, but are in lookout for upward mobility. This phenomenon possibly explains why lakhs of Patel youth gathered at the call of a virtually unknown young man who had simply rekindled their aspirations. Patels are locally known as Patidars - the holder (dar) of land deeds (pati). They have climbed the socio-economic ladder due to several factors, including investing income from cash crops into small industries and agro-processing plants such as groundnut crushing mills and cotton ginning and spinning units. But this success story is only two generations old. And only those Patels who own huge tracts of land could diversify. For others, the size of their land holdings kept shrinking as families grew over generations, says social scientist Achyut Yagnik. Of the three or four sons of a farmer with small pieces of land, at least one would typically seek a white-collar job in the city. His comfortable life would then enthuse others to break away from the village and seek employment outside, even though he had food on his plate and a roof over his head, says Yagnik. The Modi government's subsidies were only for big industries, said Prof Hemant Shah, an economist who authored a book on Gujarat's development model. The small industries, mostly owned and operated by Patels, were left to the vagaries of the market forces, Shah added. Meanwhile, new-generations Patels have moved to cities even as their parents continue to cling to their land. With jobs in cities, the only link these upwardly mobile generation have with their ancestral land are farmhouses where they spend weekends. In Saurashtra, such young people make up the bulk of the workforce engaged in the diamond cutting and polishing trade of Surat. Virtually, ghettoes of Patels have come up in that city in the last few decades. The extent of the community's influence can be gauged from the fact that several housing societies in Varachha Road, known for its diamond trade, would not sell or rent out flats to non-Patels, says a source. For several years in a row, the Hero Honda showroom on that road sold the most number of motorcycles in the country. Just last year, a diamond merchant gifted brand new cars to 70 employees. Why then should young Patels from Surat join a rally demanding reservations in government jobs? Despite the hype, the diamond trade actually has "isolated islands of growth," said the source from Surat. Only a handful of the diamond units actually adhere to international standards. The rest are 'fly-by-night' operators from Saurashtra who employ Patels from their native places for a pittance and also pack them off whenever there is a slump in the trade. With the international buyers of finished diamonds becoming more discreet, these small traders frequently suffer losses and reduce headcount. Workers have now started looking for employment in other sectors. It is easy to draw crowds at rallies in Surat due to the sheer number of Patels present in Surat, many out of a job. In 2012, at a Modi rally in a Patel-dominated area of Surat, about 40 motorbikes of diamond workers were burnt in the parking lot. The incident was never investigated but some BJP leaders bought them new bikes. For the price of 40 motorcycles, the party gained the goodwill of nearly 8 lakh diamond workers before the assembly elections. The incident illustrates how the monolithic group can be manipulated. The young Patels, driven by their aspirations, now want to move away from the rigours of the diamond trade, which now offers them an uncertain future even as real estate prices in Surat have sky-rocketed due to the huge cash siphoned off from the diamond trade. The dichotomy of the diamond and real estate business in Surat has affected the Patel workforce, who get easily swayed by any kind of promise - be it of development or of a job quota. For the young Patels, a rally that led to a cushy government job was a golden opportunity to escape the drudgery of cutting and polishing diamonds for ever. Even the hyped automobile manufacturing hub in Sanand did not generate many permanent jobs for local youths, except as drivers or watchmen said an observer. The Ahmedabad suburb was touted by many as the 'Detroit of India', but the only gains the locals made was through the sale of ancestral land. The lumpsum they made was blown away in buying big cars or apartments in the city. Perhaps Hardik Patel sensed the inherent flaw in the trend as he told a television channel in Delhi that "buying a flat in city by selling off farm land in village is not development." Several other sectors, like the state's ceramic industry (again, dominated by the Patels) now face stiff global competition. The compulsion of using environment-friendly gas in the ceramic industry in Morbi is also rendering units uneconomical. "Huge money has been spent on marketing the Gujarat model, but shrinking small and medium industries have only created joblessness," Shah said. The jobless growth has pushed increasingly pushed Patels to seek government jobs, which offer long-term social security. But, as Shah pointed out, the Gujarat government has stopped recruitments for a decade now. The state's staff strength is 9 lakh, compared with a sanctioned strength of 12 lakh. The Patel uprising now looks vigorous as people's feelings were suppressed for 10 years of Modi rule, during which land of farmers have been gradually taken away for industries, he said. "A spring kept pressed hard for years has now burst open", said Shah. TWEET THIS The Patels have been known to be well to do; why then are they agitating for quotas? Young Patels took their SUVs to attends Hardik's rallies seeking reservation. Manipur now has a bill to regulate migrants. Why is it still burning? READ NEXT >> Manipur now has a bill to regulate migrants. Why is it still burning?